Today's holiday gift guide has picks for the host or hostess. I think edible presents are always fun and appropriate as are home or entertaining related items. Is there something you usually like to give as host/hostess gifts? Congratulations to Mandy at Lavenderlilac Dream for being the lucky winner of the Blue Nile necklace! I love all of these items! They are such unique gift ideas. My favorite is the storage box and the snowglobe! Great selection of gift idea love the second row. sorry for taking so long to get here I had meeting all morning long. Such origina gift ideas!!!! Tnx for sharing!!! Really creative ideas here! I usually give flowers to the hostess or chocolates, but it's nice to have more like this in mind! Hey I just came across your blog via another blogger friend. :) Love the gift ideas here! All so pretty!!! Feliz Navidad y Próspero Año Nuevo 2014, querida Rowena!!! I just love that snow globe!! I usually give wine as a host/hostess gift, but your ideas are way more fab. These are some really nice items! Would you like to follow each other on Bloglovin and GFC? Please let me know if you're interested. Oh! I love everything! Especially the chocolates and the hot chocolate gift set!! I wish I was more of the "entertaining hostess" type of person...but I love all these picks, nonetheless! You have the best taste Rowena, when I (hopefully) visit NYC, you have to take me shopping :) Loving 6, 7, 12, 13 and 16. It was great hearing your views on my last post. Happy Holidays! That snow globe is so pretty and yes, I love everything here. hehe you can never go wrong with chocolate and truffles! Yumm! I have to try that marie belle hot chocolate! Looks so good. Cool stuff. Great ideas for gorgeous presents. 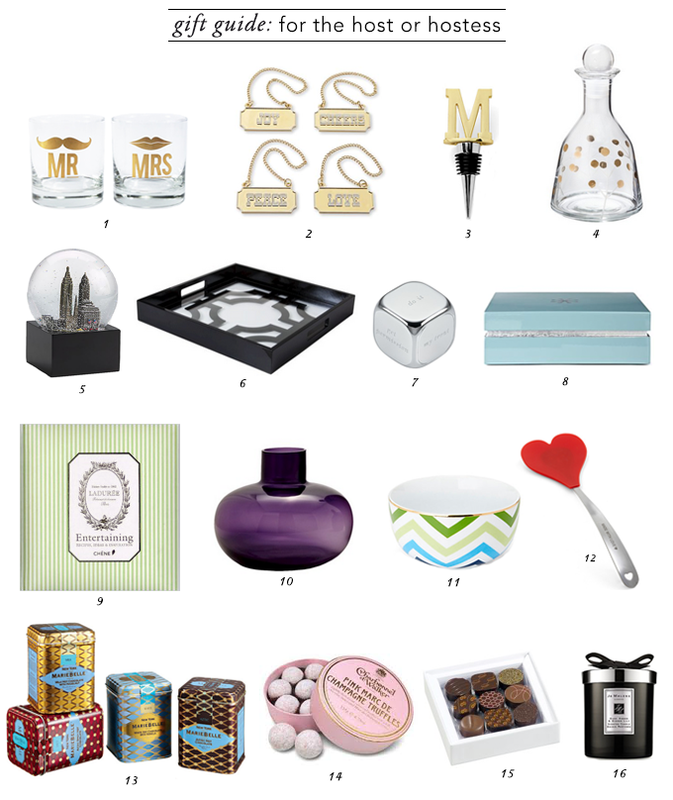 Great gift guide, love the cocktail glass set!